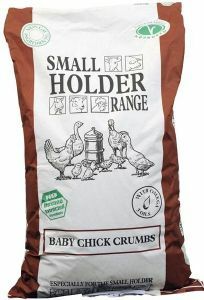 Smallholder Baby Chick Crumbs are an ideal food for to young chicks and can be fed on a free access basis. Baby Chick starter Crumbs should be fed from as soon after hatching as possible until the chicks are 6-8 weeks old. In the week before changing to Poultry Grower Pellets, it is preferable to mix the crumbs and the pellets to ensure a gradual changeover.